Motorola Moto E is a budget device and will be the first Android smartphone of a large number of buyers (especially in developing countries). After the release of Moto E, there were tons of articles on media sites describing the procedure to Unlock the Bootloader and then finally gaining Root access to the phone’s file system. If for some reason you want to Unroot your Device and re-lock the Bootloader, you must continue reading. 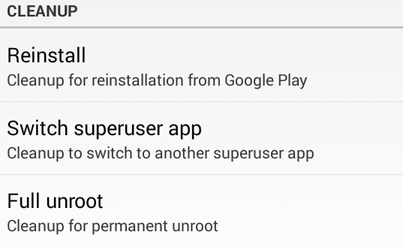 If you don’t need the root access anymore and want to Unroot your Motorola Moto E (without re-locking the Bootloader), you can easily do that from within the SuperSU app that you flashed onto your phone while rooting. Choose Full unroot under Cleanup. Wait a few seconds as SuperSU un-registers and removes itself. If you want to also re-lock the bootloader of your Motorola Moto E, you need to flash the stock (factory) firmware onto your phone and then lock back the bootloader. Bootloader is locked only after the phone verifies all files to be original and unchanged. Flashing the factory firmware will also delete all your user data and any apps that you’ve installed. In short, your phone will be returned to the same state as it came when you purchased it. 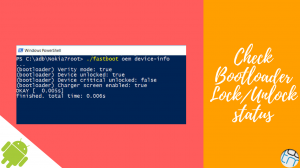 Download mFastBoot from here and extract it into the same folder where you extracted the firmware. Turn your phone Off. Press and hold the Volume Down and then press the Power button.You will boot into the fastboot menu. Connect your phone to your PC via a USB Data Cable and browse to the folder where you extracted your firmware and mfastboot files. While keeping the shift key pressed, right click on an empty area in the folder and choose Open command window here. Type or paste the following into the command prompt and press Enter key. Now enter the following code to the same command window. The processing should most probably start immediately if you are pasting the code. So you will be needed to press Enter for the last command (erase userdata) after the other processing is complete. Finally enter the following last line of code to finish locking the bootloader of your phone. The above method can also be used if you just want to reset your phone to clean factory state. Or to recover a bricked phone. Whether the phone is unlocked or not, the same command must be used to flash back the stock firmware. Thanks deej_roamer from XDA for the flashing instructions. Even after flashing the phone with factory firmware and re-locking the bootloader, the crazy Bootloader Unlocked warning at startup might still stay. In order to get rid of it, you need to flash the modified logo.bin file. Extract and Copy it to the folder where you saved your Moto E firmare. Boot your phone into the fastboot mode and connect to the PC. Run the following command in the Command Prompt window (opened within the folder where the flash files are). 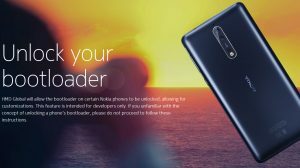 Nokia 8 receives official bootloader unlock – Here’s how to unlock! Is all the command work same on moto e2 XT1506 to lock again bootloader in mfastboot. Thank you so much, my device is locked right now. operable program or batch file. Why? I gave it to moto service care but they can’t do any thing they said. I have already unlocked its bootloader and changed os to kitkat but it was dead. I don’t understand what is the reason please help with any suggestion. i rooted the moto e but someone else unrooted so i don’t know where to copy the logo zip file and how to flash it but i am able to see the files like firmware , system , xbin ,etc , root , vendor , on my ” ES File Manager ” . can u give me instructions where to put the logo bin file exactly so it will b very helpful for me. Yes you will see that unlocked warning. 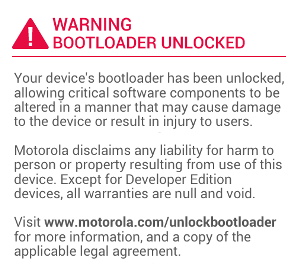 To fix that, please follow the ‘Removing the Bootloader Unlocked Warning’ section. i’ve got the moto E (2nd gen) in 4G Version. Is this methods work on it ? This won’t help you for the 2nd Gen Moto E. Recommend you to browse the XDA Forums for a possible solution. once bootloader unlocked your device is not authenticated to updates. just flash custom roms or stock roms available as unofficially. And use it. you cant relock your phone. Os arquivos para download não funcionam, Quero rebloquear bootloader urgente !!! HELLO i unlock the bootloader on my moto e. and root via kingoroot.apk after i installed chainfire 3d plugin and open it. that time my phone automatically turn off. and always showing that warning message. my phone is not working .the warning message is stuck on the screen. the fastboot mode is working. what will i do. please help me..
above links to download firmware and mfastboot are not working. i am using a rooted moto e got update to install latest android 5.1 on my device it got downloaded but then it restarts and asks to ‘install untrusted zip file i cliked on yes the it says your phone needs root access and when i press yes. it restarts the phone and process goes same. it is just a loop . any resolutio would be great. Sir, you need to restore to stock version 4.4.2 and then install via ota 4.4.4 and after that lollipop. thank you. The same problem I had faced during moto e soak test in feb 2015. Bro any pro after re lock the phone.? Hi myself Anirudha Mahale, i have Moto E with System Version: 21.12.40.condor_retaildsds.retaildsdsall.en.03 reteu Build number KXC21.5-40 I want to relock its bootloader and put stock rom but when i go to flash stock rom all I get is error i.e. “(BootLoader)Preflash Validation Failed”. I used minimal ADB 2.0 with “RETAILDSDSALL_XT1022_4.4.4_KXC21.5-40_cid7_CFC.xml” but got the same error so I tried to flash with “RETAIL-DSDS_CONDOR_KXC20.82-14_cid7_CFC_1FF.xml”, still the same error. Please Help me out. I have tried this method. But when entered the first command i.e (mfastboot.exe oem lock begin) in the command window. It is showing that and after a few minutes my moto e xt1022 is restarted normally. invalid PIV system image problem , how to sort out this? Will I get official ota update and install it successfully?? Dude your phone is I think bricked ….. This method is not working on Moto E XT1022 . yes i have done it before but when i try to open supersu app iit saying that my device is not rooted and supersu is not running………………not what can i do…………..
first i have root my phone then i have flash lollipop zip file on my moto e, now it is saying that my phone is not rooted but my phone’s bootloader is unlocked… so what can i do for rooting my moto e………. plz reply…………!!!!!!!!!!!! Flash supersu and you should be done. First try installing from the Play Store and it might just work out. My moto e is restarted again and again after factory reset.don’t no what to do. Showing moto logo on screen.from last 2 days. when i use the 1st command it just says “waiting for device” and nothing happens What should i do? Will resetting factory settings help…?? Will it remove the root and lock the boot loader..?? It will remove the root, but will not re-lock the bootloader. You cannot do that, because the online database is already updated when you request the key. i have flashed my moto e to stock but its not locking… any thoughts on what might be wrong??? hello friend i flashed slimkat unofficial via cwm recovery..and my dual sim settings and network connection not showing..please give me solution..
Are you using “Minimal ADB and Fastboot”? The site you have mentioned for downloading the stock firmware does not work. from where else can i download the firmware? What is appropriate firmware for Indian Moto E XT1022 ???? Exactly the same thing happened when I tried the mfastboot method. Any idea where can we get it from? hey, i really want to relock my phone’s bootloader but i’m not able to choose the right firmware for my phone. how do i choose which one is compatible with my phone. My moto e is a indian variant XT1022. i had installed cyanogenmod in my phone so i’m not able to locate the exact firmware.. I had the same problem. Now it is solved. You have to download the latest firmware. Sorry to say buddy but you cannot re-lock you boot-loader once unlocked. but if you are using “Moto E- XT1022” dual sim then here’s the link.. I have a problem with Part 9, entering the command after a few seconds says failed. as I can fix this? You can use the suitable ROM from those ones, provided one matches your edition. You can then update it again to 4.4.4 via OTA. Can you make a video of this so it will be helpful for others…. If there is any video on unrooting and relocking the bootloader can you share us the link..
Unfortunatly, I sold my Moto E after Re-locking the bootloader 😛 So that ain’t possible from my side. AFAIK, relocking will not be mentioned in any video. I’ll still try to find. Are you sure that you downloaded the correct firmware for your region? I am getting the same error, and I downloaded the Indian variant file named : RETAIL-DSDS_CONDOR_KXC20.82-14_cid7_CFC_1FF.xml. So please help fix this error. I don’t know why everybody is facing the similar error 🙁 It worked smooth for me. Relocking will only happen when you flash your phone to factory. Hence, no TWRP will be there. Unfortunately, its a no for most of the devices. But I think the Moto X can be rooted without unlocking the bootloader. Not super sure though. Will re locking renewal my warranty back??? I already mentioned this in the post. It wont bring it back, but there are chances of getting it as it will be hard to detect the unlocked boot loader via an oral inspection. If they check their databases,they are surely gonna deny the warranty. All depends on what all they check while taking the phone for warranty. No you will not get your warranty back because it is recorded on their server that you have unlocked your boot loader, sorry. I’ve included the solution in the post. Read the “Removing the Bootloader Unlocked Warning” part.